Last summer, while doing some cleaning of our stuff, I found an art kit in one of the boxes we shipped from Riyadh when we came back to the Philippines. It was a paper clay art kit by JNBM, which I bought from Market! Market! Taguig more than 3 or 4 years ago. The kit included an illustration board with a picture on it (outline only), 2 sticks and about 10 colors of paper clay. It is rather easy to do this art project but you need to be patient because it takes time. It’s just like coloring a picture but you’re using paper clay instead of crayons or color pencils to do it. So, just get some paper clay using the 2 sticks and put it on a spot of the picture where you want it to be. Be sure that the paper clay does not cover any of the black or blue outline and then you can prick the clay to spread it, let it stick and give it its unique texture when it dries up. When Kristel saw the kit, she said that she wanted to do it. The problem is, the paper clay was already dry so I had to buy a new set of paper clay. The cost is P15 per color. Instead of Kristel only who did the project, everyone in the family helped except daddy. I had to do more of the difficult parts. Here is the finished project. Since we still have a lot of the paper clay leftover, I told my kids that we will make another one. 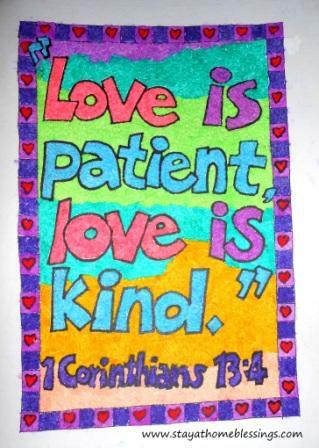 But this time, I asked my son to draw on an illustration board the verse ” Love is patient, love is kind.” Then, we worked on adding the paper clay on it. This is what the second paper clay art project looks like. Now, the only thing I have to do is have them framed and hang them on the wall. Do you like this art project? You can see more beautiful paper clay art creations at JNBM’s facebook page. If you would like to buy their art kit, they have stores at Market! Market! and SM Megamall. Just check out from their page where their other stores are located. By the way, I forgot to mention that JNBM is open for franchising. So, if it’s not available in your area or country, perhaps you can introduce it as a business. I just remembered this after reading one comment. I always see those paper clays at the mall. I was wondering naman if I will purchase those kinds, where will I display them. We have this huge hauling problem in the house that we have a lot of stuff to dispose so as much as I want to, pass muna. You don’t have to buy if you don’t find any need for it. I don’t have many decors for our home. I prefer to put pictures or DIY art projects on our walls. But it’s so tempting as they are almost on 70% off on the mall when I saw them before. Oh the impulsive in me always says that it’s on sale! Haha.. I used to do clay art when i was pregnant after a loong day in the office. It helps me relax. The kids did like it though they had a little difficulty putting paper clay on the small and narrow spots. Nice work. I love making DIYs and crafts too. 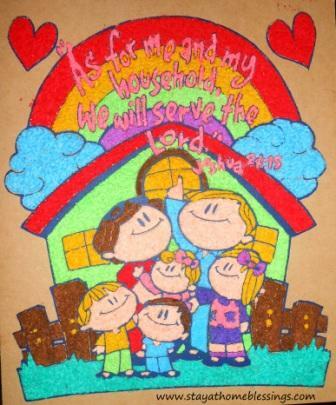 Lovely family art project that you did. Nice works. Paper clay. That is something new to me. Sounds interesting. Btw, the words are inspiring. My daughter chose the bible verse for the second project. This is interesting and good activity for kids. I like your works, so colorful. Thanks. Medyo time consuming din lang sya. Saka pag medyo matanda na pala, masakit din sa fingers. they look so nice and colorful, perfectly made. I’ve seen the same art before, but your post makes me want to try it with my kids too. thanks for sharing! Very nice wall art that could be! I actually haven’t seen or used a paper clay before.. I guess it is like a thin clay perhaps? It’s not really like clay or play-doh we know. I think it’s made of mashed paper with thin liquid glue.